I had the great opportunity to take in the first Intelligent Communities Forum (ICF) Summit, in Moncton. I thank the City of Moncton for making the investment and taking such a proactive lead to bring a high calibre conference focusing on broadband and the Internet to increase regional, economic and social development to the city. Communities that invest in broadband are investing in their companies and their citizen's work-life balance. What was so inspiring about this conference was it was not about technology but about how the Internet supports personal and business connections in ways that we never imagined. It was about the people and how easy we make it for them. As Richard Bendis, CEO of Innovation America, puts it: change is inevitable with the fast paced power of the web. If you're hesitating as an owner or senior manager, you are creating liability for your firm's longevity. Listening and collaborating with your target market users can significantly increase your unique value proposition -- which is how your relevant use of the web can help your long-term success. 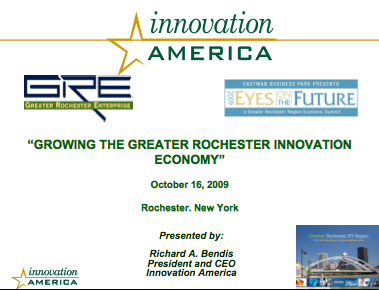 The Rochester region has many assets to foster econmic growth and could benefit by having one person - an "innovation intermediary"- who makes it easier for the region to bring innovation to the marketplace. That's the message of Richard Bendis, keynote speaker and one fo the scheduled panelists at next Friday's annual Eyes on the Future, a regional economic summit, at St. John Fisher College. Eyes on the Future, an annual conference of business leaders from across Rochester, will again meet this Friday at St. John Fisher College. The summit’s theme will be to promote economic growth in the area as a team, said Tom Ioele, event chairman and CEO of Employee Relations Associates Inc. of Rochester. Ioele said the conference hopes to get people thinking of ways to effectively change the Rochester economy for the better. Attracting jobs and interest too often can solely be left to leaders such as Monroe County Executive Maggie Brooks or officials in Greater Rochester Enterprise, Ioele said. “So often, we think it is someone else’s job,” said Ioele. The event, which drew about 1,000 people last year to the college, will also feature an exposition focusing on career development, although the event will not contain a job fair. The exposition will help with résumé skills and advice on running a business. The event will also feature a keynote speaker, Richard Bendis, CEO of Innovation America. Bendis is an entrepreneur and former corporate executive, venture capitalist and investment banker. Innovation America is a nonprofit, private-public partnership focused on accelerating the growth of the entrepreneurial innovation economy in the United States, according to its Web site. The doors open at 7 a.m. for the expo and career fair. At 8:30 a.m., the conference will host a panel discussion until about 10:30 a.m. The expo and networking will continue until noon. Registration is free and should be done in advance at eyesonthefuture.biz. MONCTON - Richard Bendis will tell an audience of entrepreneurs and officials in the knowledge industry today that growing business in a wired community is not just about technology. The CEO of the Philadelphia-based national private-public intermediary Innovation America is trying to spur a mindset shift towards better using human connectivity to leverage funding and talent to build companies - on top of focusing on market-relevant products. "The difference I talk about is from technology-based economic development to innovation-based economic development," Bendis said in an interview Monday, ahead of meetings with members of a Moncton-based high-tech incubator nearing its launch. Bendis will give a morning address today at the Delta Beauséjour hotel to help kick off a two-day summit on intelligent communities. This summit, in part, came to be after Moncton and Fredericton were named to this year's top seven smart cities list by the Intelligent Community Forum, a New York-based think-tank devoted to assessing how broadband can grow jurisdictions. If You Are Interested in Strengthening the Economy, This is the Conference to Attend! While even small businesses now have global market opportunities, they now also have a whole world of competitors, he noted. They also face a product cycle in IT especially that has shifted from years to months. "It's changed the rules, but it doesn't mean we can't learn those new rules," Bendis said. The need to adapt readily was also echoed by a local voice. "If intelligent communities around the world share one thing, it's that we're dedicated to constantly re-inventing ourselves," Moncton Technology Group head Doug Robertson said. The first Intelligent Communities Summit kicked off last night in downtown Moncton with a meet and greet, but the real meat and potatoes of the three-day affair begins today with all-day seminars and networking sessions scheduled for the Delta Beauséjour Hotel. An event that aims to showcase once again just how intelligent and innovative Moncton is, it comes on the heels of the city being named one of the Top 7 intelligent communities of 2009 by the Intelligent Community Forum earlier this year. 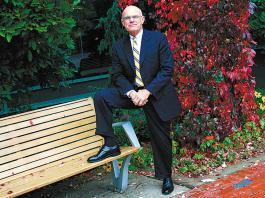 The meeting will be hosted by the University of Victoria’s Vancouver Island Technology Park and will focus on Advancing Global Research Park Networks. Topics to be discussed during the conference include the basics of building, filling and marketing research parks. Discussions will also focus on sustainability options and models for future growth. The AURP 2009 Annual Conference will present British Columbian technology and research parks the opportunity to meet and network with thought-leaders from around the world. Delegates from research parks, governments, universities and industry from around the world will address current issues and examine models for continued growth and sustainability. The AURP room block is on a space available basis and expires Friday, September 4, 2009. Join fellow entrepreneurs, business leaders, creative industry and technology professionals to participate in the Global Creative Economy Convergence Summit 2009, a two-day conference which promises to embrace the same values it champions: innovation, creativity, collaboration, shared learning, technology and open source thinking. If you are having trouble viewing this email with images, go here. The Ewing Marion Kauffman Foundation today officially launched "Build a Stronger America," a movement to unite entrepreneurs and help give them a stronger voice in the public discussion about the country's economic future. The Movement went "live" before 1,200 of America's most prolific entrepreneurs at the Inc. 500/5000 conference in Washington, DC. Through the Movement's Web site entrepreneurs and business owners will have, for the first time, a central hub to share their stories, hear about issues affecting them and create a unified voice. Kauffman Foundation studies have shown that entrepreneurs historically have been key drivers of economic recovery in past recessionary periods. Since 1980, companies less than five years old have accounted for virtually all net new job creation in the United States. Unfortunately, a recent Kauffman Foundation poll of hundreds of entrepreneurs and would-be entrepreneurs shows how badly entrepreneurs need help. "Pessimism and revenue loss among entrepreneurs on the front lines of the economy indicate that the fruits of economic recovery have yet to hit Main Street," said Carl Schramm, president and CEO of the Kauffman Foundation. Kauffman Foundation President Carl Schramm has an op-ed in today's Huffington Post, Join the Entrepreneurs' Movement That Launches Today: A "Cause" for our Economy that explains how entrepreneurs are key to our economic recovery. Entrepreneurs nationwide know firsthand about the transformative effect that starting a business can have on individuals and their communities. While Americans understand that entrepreneurs are critical to economic growth, our national dialogue doesn't include comprehensive discussion of policies that promote private sector, job-creating reform. We are pleased to invite you to a special LIVE streaming video event this Friday, September 25 at 5:30 p.m. EST at Build A Stronger America's Web site featuring Chris Gardner, entrepreneur and inspiration for the film, The Pursuit of Happyness, and author of the new book, Start Where You Are: Life Lessons to Get From Where You Are to Where You Want to Be. This exclusive event is a celebration of the launch of Build a Stronger America, The Entrepreneurs' Movement, a new initiative of the Kauffman Foundation to highlight the important role entrepreneurs play in the economy and to educate policymakers about what entrepreneurs need to succeed. MONCTON, Sept. 23 /CNW/ - From October 5-7, Moncton will be home to the first ever Intelligent Communities Summit. The Intelligent Communities Summit, "Leveraging Technology for Community Development" will bring together international leading-edge community, academic and private sector leaders to share best practices and engage participants to brainstorm next steps in leveraging technology to enhance private sector growth and community development. These next steps will be designed to help businesses and communities weather economic storms, prosper and improve quality of life. Three hundred angel investors, early and seed stage venture capitalists, economic development and technology transfer professional services, gathered for the annual National Association of Seed Venture Funds (www.nasvf.org) conference, listened to some of the country's top experts on early stage investing, economic development and technology transfer. On the first day of the conference, members were polled on variety of topics related to the direction of the economy. The attendees are optimistic about the economy and the performance of the Obama administration. I want to thank everyone that attended the NASVF Conference in Oklahoma City, Oklahoma this week and especially our host, the Greater Oklahoma City Chamber and all the sponsors that supported this fantastic event. There were many great opportunities to learn from the best practitioners in the country at the diversified panel discussions along with listening to keynote presenters. When leaders are looking to communicate with the Canadian people, the Economic Club of Canada is the choice forum. That's why the club has welcomed people such as Prime Minister Stephen Harper, Senator John McCain, Ukrainian president Victor Yushchenko, and California governor Arnold Schwarzenegger to its podium in downtown Toronto in the past few years, not to mention practically every Canadian premier and cabinet minister. Next month, that prized podium will hit the road, coming to Atlantic Canada for the first time so that one of the brains behind Barack Obama's epochal social media campaign for president can speak to the people of Metro Moncton. The National Association of Seed and Venture Funds conference in Oklahoma City is Sept. 14-16 at the Skirvin Hilton Hotel. This year is the 16th annual event from NASVF, a global nonprofit that promotes investments in seed and early-stage companies by supporting entrepreneurs and creating jobs from innovative capital programs. The organization connects investors, economic development organizations and tech transfer professionals all looking to create stronger economies and jobs. Presenters and attendees at the two-day event get the chance to share ideas and discuss strategies. The conference regularly draws seed and early-stage fund managers, fund-of-fund managers, state venture capital leaders, angel investment leaders, institutional investors and tech commercialization experts. For an agenda of the conference, including times for sessions and speakers, go to www.nasvf.org/confapp.php. Welcome to the first Intelligent Communities Summit! The Summit provides an exceptional opportunity for CEOs of corporations, mayors and senior municipal government officials, business leaders, economic developers, educators and interested individuals to meet and hear international leading-edge community, academics and private sector leaders who will share best practices and engage participants to brainstorm on the next steps in leveraging technology for community development. These next steps will be designed to help businesses and communities weather economic storms, prosper and improve quality of life. Over the past 20 years, Moncton transformed itself from a blue-collar town with an uncertain future to one of the most diversified and fastest growing metropolitan centers in Canada. The success of its transformation is entirely due to its focus on the Broadband Economy, and how all stakeholders have collaborated to leverage technology for community development. The hard work of the past two decades was recognized earlier this year when the Intelligent Community Forum in New York named Moncton one of the 2009 Top Seven Intelligent Communities in the world. In fact, the Canadian Province of New Brunswick has been identified by the Intelligent Community Forum as a best practice model. 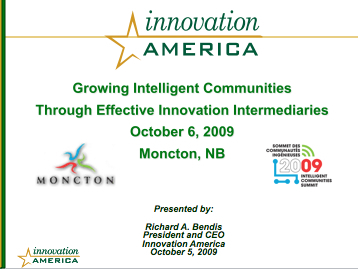 This year, two New Brunswick cities, Moncton and Fredericton, are among the 2009 Top Seven Intelligent Communities. An experienced hand at developing capital resources will headline the Entrepreneurial Development Center’s fourth annual Expo. 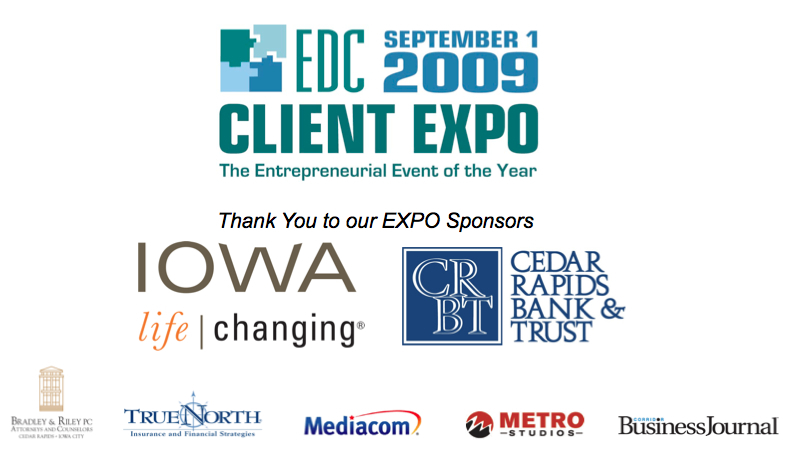 Richard Bendis, president and CEO of Innovation America, a national private/public partnership focused on entrepreneurism, will talk about capital fundraising challenges at the Sept. 1 event at Kirkwood Center for Continuing Education in southwest Cedar Rapids.